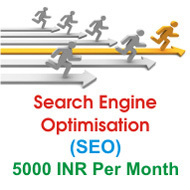 SEO is an act to make a website healthy and rich for search engines and visitors. Healthy denotes the site should have relevant information for visitors and rich denotes the site should ethically ranked and rewarded by the Search Engines. how to get the rankings ? SEO is potentially the most important search marketing approach for marketers since most searchers click on the natural listings ororganic listing. The human mentality of reading from left to right always intend us to focus on the left part. Indeed, research shows that some searchers NEVER click on the sponsored listings. Generally, the 80:20 rule holds true with 80% of the clicks on natural listings and 20% of the clicks goes on the paid listings. A key benefit of SEO is that it is relatively cost-effective since there is no payment to the search engines for being placed there. What you need to do is to hire ethical SEO company or if you have your own in-house development then better option is to for a SEO Consultant. Best and Affordable SEO services in all the Regions of the world.